70 minutes of music, tablature and lots of "eye candy"
December 5th La Bourre An. December 7th A Toy An. December 8th The Spanish pavin An. December 9th Il Villanico An. December 10th Three Toys An. December 14th Drawe neare me and lowe me An. December 15th Two Toys An. December 17th The morris An. December 20th The Canaris An. December 22nd Branle Gay An. December 24th Joseph, lieber Joseph mein An. December 27th Pavana Spagnolet An. December 29th Puis quæ tu es sibelle An. December 31st Il Cesarino An. January 2nd Il Spagnoletto An. January 3rd Branle Gay An. January 4th A Ballad An. January 5th La volta Lettis Rich An. January 10th Patkintons componds An. January 21st Les Canaris An. January 23rd Three Toys An. January 24th Markett is done An. January 25th Branle Gay An. January 27th Lighte of Love An. January 29th A Jig An. January 30th Lothe to Departe An. February 1st Two Grounds An. February 2nd Corrente francese An. February 4th Poor Tom of Bedlam An. 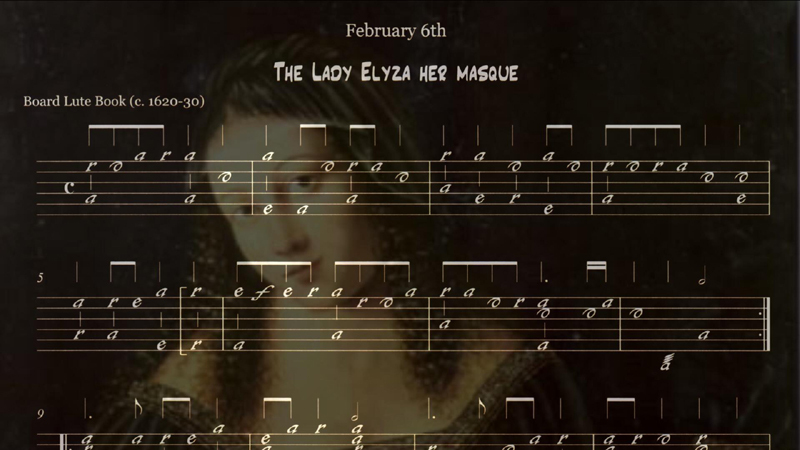 February 6th The Lady Elyza her masque An. February 7th Corrente francese An. February 8th Passo mezzo in discant dal Nicolo Nigrino An. February 11th Tanz - Hupff Auff An. February 13th Cruelle d'artie An. February 14th Pavana Spagnolet An. February 18th A Toye An. February 19th Fayre my systers disdayne me not An. February 21st A Ground An. February 24th Al Almane An. February 27th A Pavin An.